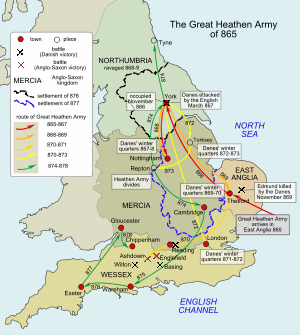 The Viking invasion of Britain in 865 AD is sometimes called the Great Heathen Army, or Great Danish Army or the Great Viking Army. Previous invasions were for loot, but this one led to semi-permanent settlement. A large force of Danish Vikings attacked Anglo-Saxon England. This army appeared in East Anglia in 865. Unlike earlier Vikings who made brief raids on England, the Great army stayed for many years in an attempt to conquer all of England. The first recorded Viking attack in England was in 793 at Lindisfarne. The Anglo-Saxon Chronicle reported " the havoc of heathen men miserably destroyed God's church at Lindesfarne." There were many reasons that Vikings began attacking England. The populations of Norway had been growing between the 7th and 9th centuries. The Vikings were pagans who often had several wives and many sons. These young men filled the ranks of armies and joined ship's crews to go on adventures. The beginning of trade between Europe and England had opened up great trading centers. Vikings were traders but at the same time resorted to piracy when it suited them. This was especially true when they found new lands and people who were not well protected. The first raiders from the north who set foot in England were from Norway. They sacked and killed monks at Lindisfarne and at Jarrow the following year. The Norwegian Vikings then established colonies in the Shetland and Orkney Islands. They also settled in Ireland. The Vikings from Norway only came back to England in the 10th century and from their settlements in Ireland. The Swedes, called the Rus, were to later expand eastwards into Russia. In 835 there was a raid at the mouth of the River Thames by Danish Vikings. For the next thirty years these attacks on England continued. In 850 Canterbury and London were attacked by a Danish band led by Rorik. He was defeated and killed the next year by Athelwulf of Wessex. Only twice had a Danish army spent the winter in England: in 850 and 854. In 865 the Danish Vikings changed their tactics. A large army made up of many smaller bands landed in East Anglia. For over a decade they remained in England destroying entire kingdoms as they went. The Danes spent the winter in East Anglia. The local people bought peace with the Vikings by supplying them with horses. After a year they moved northwards to Northumbria now a mounted army. They captured York and defeated two Northumbrian kings, Aella and Osbert, who joined forces to attack the Danes. Both kings were killed. In 867 they appointed a client-king[a] named Ecgberht over the Northumbrians. In the fall of that year they moved south into Mercia. The Danes made their winter camp at Nottingham. 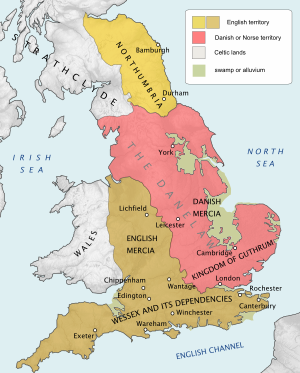 In 868 Burgred, the King of Mercia, asked King Ethelred of Wessex and his brother Alfred for their help against the Danes. The Danes did not fight but allowed the Mercians to pay them for peace. The Vikings later withdrew to York. The next year, 871, the great Viking army grew much larger. After twelve months in York, the great army moved south again into East Anglia. Setting up winter quarters at Thetford they defeated King Edmund of East Anglia. Next, in the fall of 870 they moved to Reading. [b] Athelred with his brother Alfred arrived with their army to meet the new threat. In the battle that followed, the Battle of Reading, both sides suffered many casualties. Athelred's army was defeated. Four days later the two armies met again at the Battle of Ashdown. This time the West Saxons won the victory and the Vikings retreated to Reading. Two weeks later Athelred and Alfred led the West Saxons against the Danes at Basing where the Danes won. Two months passed without any fighting between them. The next battle was at a place called Merantun. After a day long battle which the English were winning, the Danes were able to regain their lost ground. Just after mid-April in 871, Athelred died. At this point Wessex was the last remaining kingdom that hadn't been destroyed by the Vikings. Within a month, Alfred, who replaced his brother as king, was defeated at Wilton. There were nine more battles between the West Saxons and the Danes in the next year. Wessex finally paid the Vikings for peace which ended the fighting. Alfred remained on the throne. Of the two known leaders of the Danes, Ivar the Boneless disappeared from the records after 871. His brother Halfdan Ragnarsson was still the leader when the Danes withdrew from Wessex to winter in London the same year. In 872 the Northumbrians rebelled against the Danes and ejected King Ecgberht. They placed King Ricsige on the throne. Ecgberht took refuge in Mercia. The Danes came north to put down the rebellion, but succeeded only in subduing Deira. Within a few weeks the Danes set up their winter camp at Torksey in Mercia. [c] The Danes had operated as a single army for nine years. But in 874 it divided into two armies. They never reunited. The Danelaw made up one-third of England at the time. In 874 Halfdan took his followers north to camp at the mouth of the River Tyne. They raided the Picts and Britons in Strathclyde for the next year. But there was little gain in raiding these poorer areas. The Danes had plundered the wealth of most of England and little was left. Halfdan began settling his men in the area of York. The other army led by Gutheram, Oscytel and Arnuld was still fighting against Wessex at the time. By 876 they had concluded a peace with Wessex. In late 878 Guthrum's band withdrew to Cirencester in Mercia. In 879 they moved to East Anglia. The leader Guthrum, known by his Christian name Aethelstan, reigned as king until his death in 890. According to the Anglo-Saxon Chronicle 'they occupied the land and shared it out.' In 878 a new Danish army was camped at Fulham. But by 879 they had left England for the Low Countries. The settling of a large part of conquered England by the Danes became known as the Danelaw. It became the part of England where the laws and customs were Danish not English. At this point England became divided into three parts. These were Wessex, English Mercia and the Danelaw. The Danelaw was a mixture of the native populations and the members of the great army who settled there. Many placenames were Danish. Many of the words in the English vocabulary have Danish origins. As late as the 11th century when a Scandinavian[d] came to England he did not feel out of place. The languages was the same and the customs were the same. This was true until the Norman conquest of England in 1066 when French was introduced into England. ↑ He served as a tax collector for the Danes. He was probably a royal claimant to the throne of Northumbria. ↑ Frank Stenton suggests they left Northumbria because they didn't want to waste time on an already plundered land. ↑ Someone from Norway, Sweden or Denmark. This page was last changed on 9 October 2018, at 13:06.